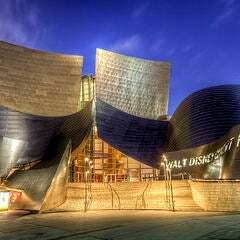 Along with Diego Rivera and José Clemente Orozco, the great Mexican muralist/painter, David Alfaro Siqueiros established "Mexican Muralism." 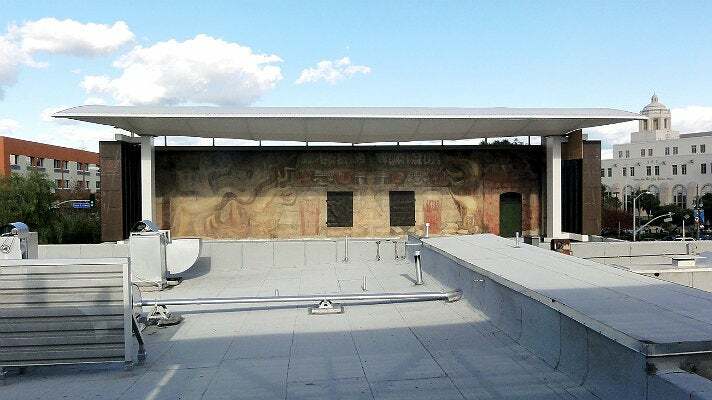 The tradition continues in Mexico today and inspired the Chicano art movement in the U.S. During his time in Los Angeles, Siqueiros created América Tropical, an 80x18 foot mural located above Olvera Street, the birthplace of Los Angeles. Completed in 1932, the mural depicts a Mexican Indian crucified on a cross beneath an American eagle, with two sharpshooters aiming at the eagle from nearby. 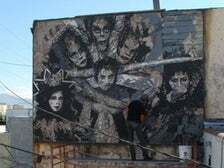 It's the first large-scale mural in the U.S. that created a public space by being painted on an ordinary exterior wall. The mural’s political message about the exploitation of Mexican workers caused immediate controversy, and it was soon completely whitewashed. 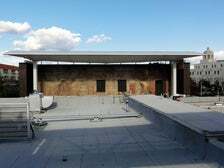 América Tropical was restored by the Getty Conservation Institute and opened to the public in October 2012 with a new viewing platform and interpretive center. Siqueiros: La Voz de la Gente! 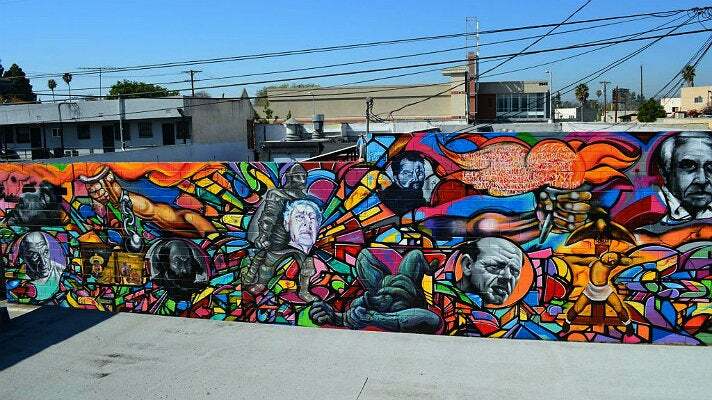 In February 2012, a stellar group of artists paid homage to David Alfaro Siqueiros with Siqueiros: La Voz de la Gente!, located in an alley off La Cienega Boulevard in Culver City. The mural was painted as part of Latino Heritage Month. 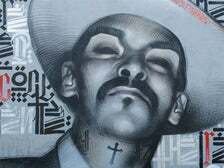 The collaborative work was organized by Anna Siqueiros, the iconic artist’s great-grand niece, who gathered famed muralists and graffiti artists such as Ernesto de la Loza, Willie Herrón III, Carlos Callejo, Carlos Duran, Juan Carlos Muñoz, Fabian Debora, Raul Gonzalez, Nuke, Defer, Blossom and more. 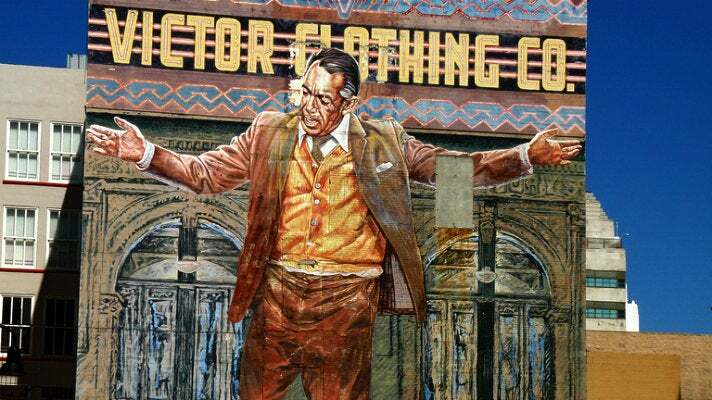 Across the street from the landmark Bradbury Building in Downtown L.A. is the Pope of Broadway, a 70-foot mural of legendary Mexican-born actor Anthony Quinn. 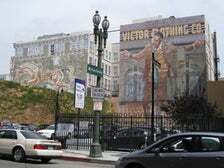 Painted by Eloy Torrez on the Victor Clothing Building in 1984, the mural depicts Quinn dancing in front of the Bradbury Building. Quinn’s pose evokes his Oscar-nominated performance as the title character in Zorba the Greek. 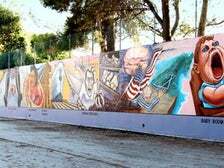 This epic, half-mile long mural tells the story of California from prehistory to the 1950s. Known as one of the longest murals in the world, The Great Wall of Los Angeles contains chronologically ordered vignettes, beginning with dinosaurs on one end and the Baby Boom at the other. 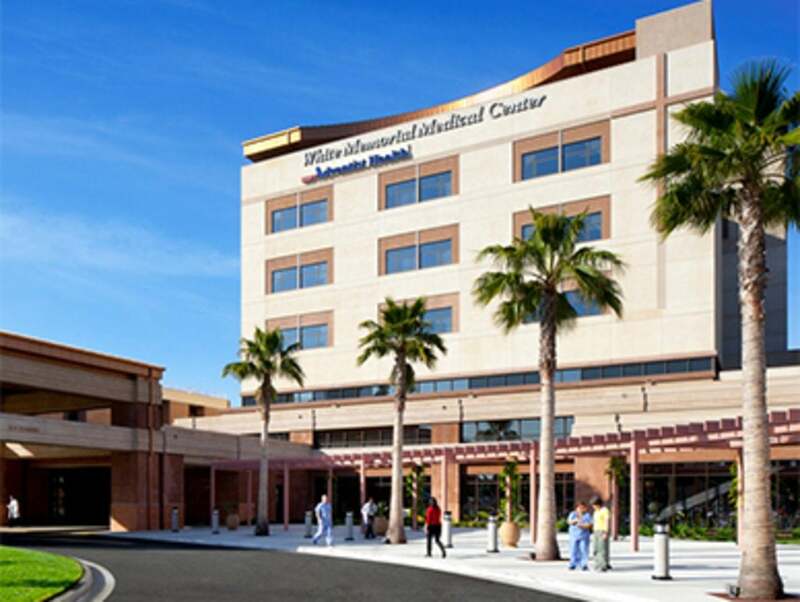 The mural was designed by Judith Baca, founder of the Social and Public Art Resource Center (SPARC). The mural was begun in 1974 and completed over five summers, employing over 400 youth and their families from diverse social and economic backgrounds, working with artists, oral historians, ethnologists, scholars, and hundreds of community members. 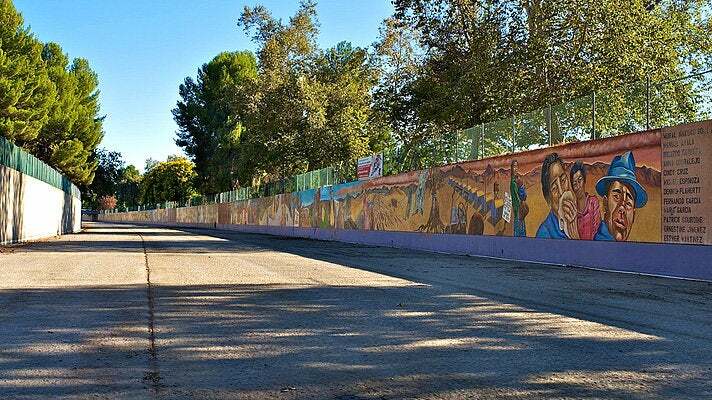 The East San Fernando Valley is home to numerous murals depicting the life and people of the area. 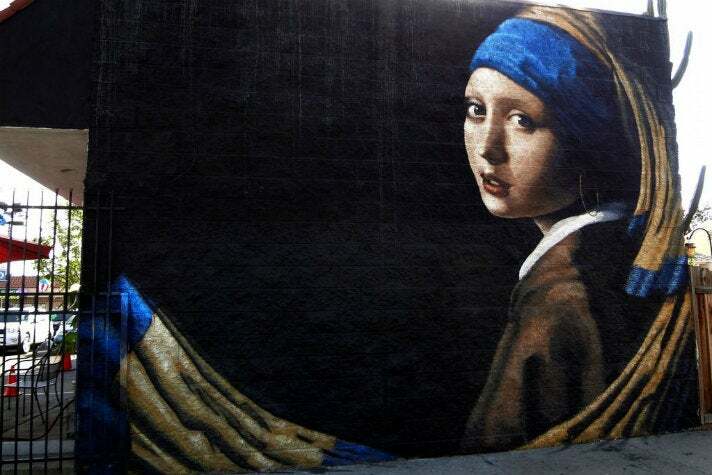 The Girl with the Hoop Earring, by artist Levi Pónce is a local twist on the Vermeer masterpiece, Girl with a Pearl Earring. Another mural by Pónce, Pacoima Art Revolution, reinterprets the iconic Mona Lisa - she’s holding a dagger and wearing a sombrero, representing La Adelita, from a folk song of the Mexican Revolution. 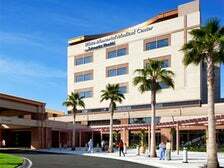 The grounds of the White Memorial Medical Center contain many paintings, sculptures and tile work for patients to peruse as they convalesce. One of the most prominent is a tile mural on the Cesar Chavez Avenue side, Comunidad by Jose Ramirez. The 2004 mural features a Los Angeles cityscape in the background and its multicultural citizens in the foreground. 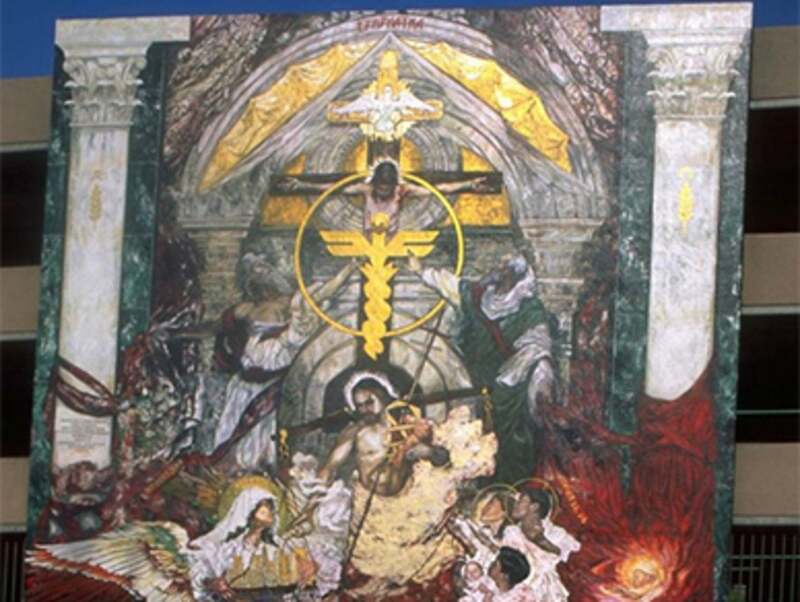 Across the street from the medical center is Tikkun Olam - To Repair the World, by George Yepes. The 1997 mural rises 36 feet on the side of a parking lot, depicting Christ on the cross as well as after his resurrection. Music fans will recognize Yepes from his cover art for the 1988 Los Lobos album, La Pistola y El Corazon. The tag team (pun intended) of El Mac and Retna have created numerous murals that combine photo-realism with urban iconography and typography. 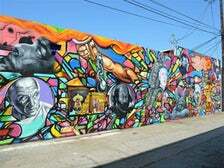 East Hollywood in particular is home to noteworthy murals, such as La Reina de Thai Town (on the corner of Wilton and Hollywood) and Kannon/Kuan Yin on Western, north of Melrose. The duo’s murals in less trafficked areas are exceptional and worth seeking out. Located at the corner of Chesapeake and Jefferson, The Knight features a man of ambiguous heritage in front of both Spanish and English text. The 2009 mural was created to promote peace and harmony as a response to gangs. The text to the right of the man and on the brim of the hat quotes lyrics from Marvin Gaye’s classic, What’s Going On. 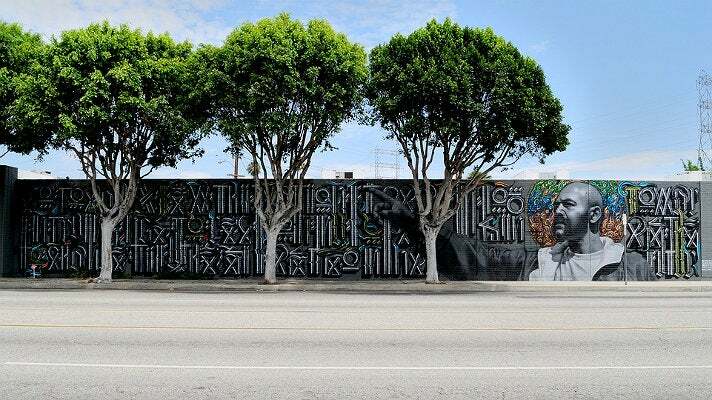 Another collaboration between El Mac and Retna is Of Our Youth, located on the side of the former Graphaids art supply store on La Cienega. 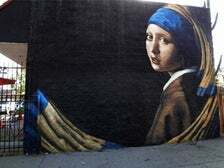 In his blog post, El Mac says this mural was inspired by the time the artists spent painting their previous mural, Blessed are the Meek. “The figure is based on a photograph we took there of a man named Ralph, or Chato, who had some inspirational words for us on the theme of redemption.” The text to the left of the figure is taken from this conversation: "So today I'm trying to change a few things to rectify the situation of my past. 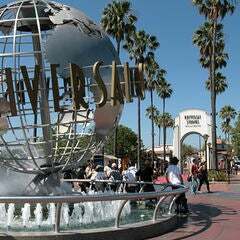 So today I'm looking towards the future (of our youth highlighted)." 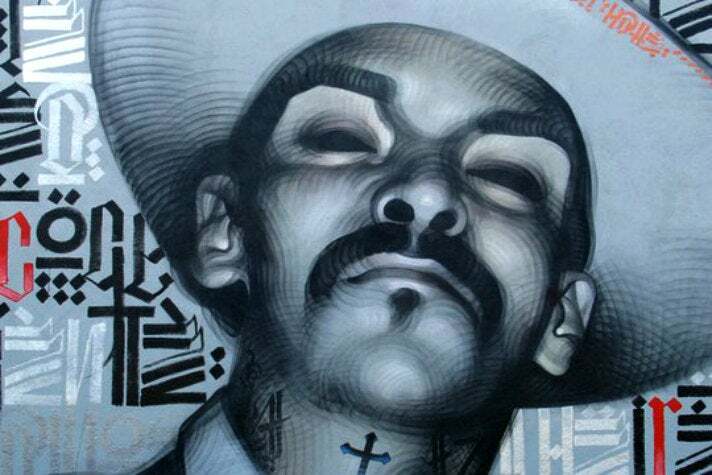 As part of the landmark 2011 Pacific Standard Time initiative, famed muralist Willie Herrón III created Asco: East of No West, a mural located in the alley at City Terrace Drive, behind the Alvarez Bakery in East L.A. The mural was created to coincide with the exhibition Asco: Elite of the Obscure, A Retrospective, 1972-1987. 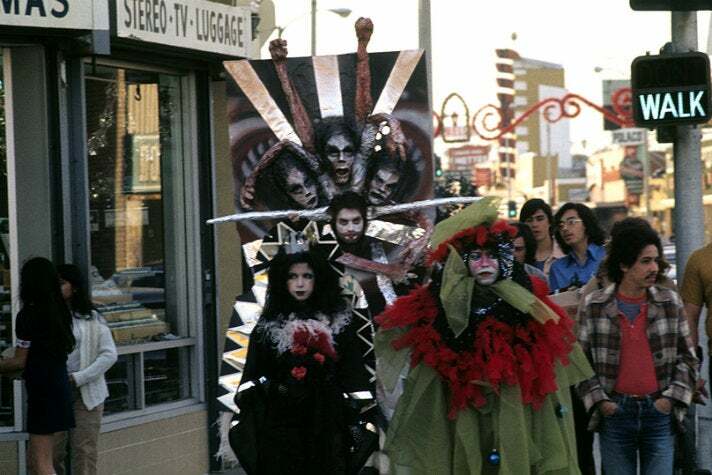 Herrón’s mural is based on a photograph of a 1972 Asco performance, Walking Mural, by his Asco collaborator, Harry Gamboa Jr. Led by the Getty, Pacific Standard Time: LA/LA launched in September 2017 and explores Latin American and Latino art in dialogue with Los Angeles. Pacific Standard Time: LA/LA presents a wide variety of art, much of it unfamiliar to Southern California audiences. Its series of groundbreaking exhibitions takes a fresh look at major artistic movements and contemporary artistic practices, and includes artists from South and Central American, the U.S., Mexico, and the Caribbean. 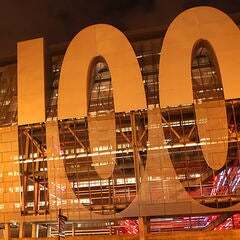 1701 East Cesar E Chavez Ave.